Boiled vegetables are rather boring. The water washes away flavor, and nutrients. Without careful timing the veggies come out limp and dull. Roasting on the other hand concentrates the flavors with the added bonus of some nice charring if you are lucky. Preheat oven to 450°F with rack in the middle position. Line a half-sheet pan with aluminum foil (for easy clean-up). Toss green beans with olive oil and scatter between two unlined sheet pans. Better to have overlapping beans than everything squished into a single layer. Sprinkle with about 1 teaspoon of kosher salt. Transfer to the oven and cook for 5 minutes. Swap and rotate the sheet pans. Return to the oven for an additional 5 minutes. Remove pan from the oven to a cooling rack. Drizzle with sesame oil, sprinkle with toasted sesame seeds and freshly ground black pepper. Transfer to a serving dish and enjoy. After trimming the green beans I use a salad spinner to rinse off any dust that clings to them. Fill the salad spinner with water, add the beans and swish them about. Lift out the perforated basket and dump the water. Refill with water and repeat until the water runs clean. Then give the beans a couple of spins to get rid of excess moisture. You’ll want to keep a hand on top of the spinner though or it might fling itself off the counter. I referenced a recipe from Cook’s Illustrated when I started this and ended up only using the cooking temp/times. One day recently, while musing in my head over what to make for dinner, I decided I had to have mashed potatoes that night. There were potatoes sitting in a drawer, surely turning to mush, and the only possible preparation for them was mashed. I also had pulled some frozen sausages from the freezer a night or two before. 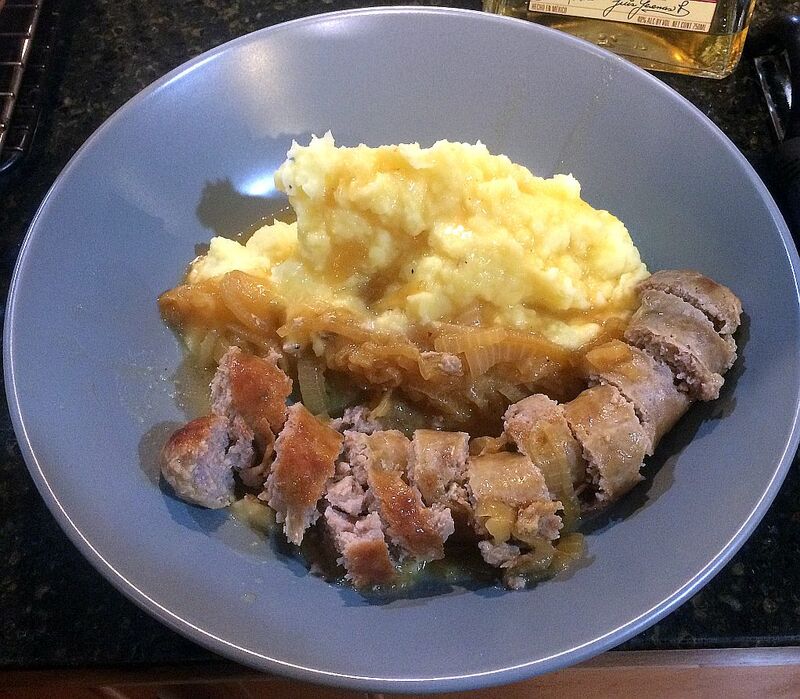 How to combine mashed potatoes and sausages became my mental exercise for the rest of the day. Gravy became the solution. Heat oil over medium heat in a large pan or skillet until the oil shimmers. Add the sausage links and cook until browned on both sides, 5-6 minutes total. Transfer sausages to a plate. Return the pan to the heat and add the onions to the pan. Sprinkle with a generous pinch of salt and pepper; stir to coat with oil. Cook for 3-4 minutes until the onions start to soften. Return the sausages to the pan along with any drippings. Add the broth and bring to a simmer. Reduce heat to low, loosely cover and cook for 5 minutes. Check the internal temp. of the sausages; if they have reached 160°F the remove. If not continue cooking until they reach 160°F. After removing the sausages continue to cook the onions and broth, uncovered until the liquid has reduced by at least half; about 10 more minutes. Add the butter and mix in to flavor the gravy. Taste and adjust salt/pepper as desired. Serve with mashed potatoes and a side veg of your choice. A bit of fresh thyme cooked with the gravy, or some chopped fresh parsley at the end, would have added a bit of fresh green taste to the dish. Still quite good. We’re in a odd part of the year where random Saturday events are keeping us from our regular Saturday night schedule. We skipped last week so that we could attend a cookout/fundraiser and we’ll be skipping this coming Saturday so that I can stunt host a local poetry event. Still we did hold a Saturday night this week with tasty food worth remembering. We first learned of this Puerto Rican mainstay from Chef Daisy Martinez in her PBS program, Daisy Cooks!. Her description, and the unknown to me ingredient of achiote oil, led us to give it a try. The result has kept it in our cooking repertoire. The original recipe called for a nice piece of pork or smoke turkey wings to help flavor the dish. My version is vegetarian and doesn’t seem to be missing a thing. Heat the achiote oil in a heavy Dutch oven over high heat until shimmering. Stir in the sofrito, olives, salt, pepper and cumin. Cook the sofrito until the liquid evaporates and the mixture starts to sizzle, about 5 minutes. Stir in the rice and mix to combine with the sofrito mixture. Cook for 2 minutes, stir, cook for two more minutes. Add the pigeon peas and broth. Stir once and bring to a boil. Reduce heat to low, cover the pot and cook until the water is aborsed, about 20 minutes. Turn off the heat and remove the pot from the burner. Place a clean dish towel between the lid and the top of the pot; this will absorb excess moisture that would otherwise drip back onto your rice. When ready to serve fluff the rice then give it a taste; adjust salt and pepper as desired. Achiote oil is made from annatto seeds and olive or vegetable oil. Place 1 Tbsp. annato seeds in a small skillet along with 1/2 cup olive oil. Cook over low heat for about 10 minutes until the oil is stained red. Drain the seeds before using. You can store achiote oil in the fridge for 2 weeks. Sofrito is a cooking base used in Latin American, Spanish and Portugese cuisine. I have a recipe for my version somewhere here. We’ve used both the frozen and canned pigeon peas. The canned ones are salted so rinse well and reduce the kosher salt to 2 Tbsp. You can always add more salt at the end however it’s rather difficult to take it away from the finished product. Happy belated 4th of July. We celebrated in our usual Saturday night fashion, with food. Whenever we get a Chinese takeout order over $35 the restaurant adds a small order of white rice and a small order of over-steamed broccoli. The broccoli ends up in the compost pile however the rice usually ends up in the fridge for a couple of weeks before it is dumped in the trash as questionable. We enjoyed Chinese takeout last Friday night so I knew the rice was “fresh”. So I crafted this recipe to make use of it along with some chicken breasts I had defrosted over the weekend. Combine soy sauce, vegetable oil, fish sauce, sesame oil, coriander, a pinch of kosher salt and 10 grinds of black pepper in a bowl. Added diced chicken. Use hands to coat chicken with marinade ingredients. Cover with plastic wrap and rest in the refrigerator for 20 minutes. Heat 1 1/2 tablespoons of peanut oil in a non-stick skillet over high heat until shimmering. Added onions and peppers to the skillet; toss to coat in oil and evenly distribute. Ignore for 2 minutes. Toss or stir to redistribute. Ignore for another 2 minutes. Toss or stir to redistribute. Ignore for another minute. Edges should be lightly colored and onions should be opaque. Transfer to a bowl and cover; set aside. Add remaining oil to the skillet and return to the burner over high. When wisps of smoke start coming up from the oil add the marinaded chicken. Shake to evenly distribute and ignore for 5 minutes. Break up chicken pieces that may have clung to one another and toss to redistribute. Cook for another 4-5 minutes. While the chicken cooks microwave the rice for 1 minute just to take the chill off of it. After 9-10 minutes of total cooking time check temp on a largish chicken piece. If it is less than 160° continue cooking, checking every 30 seconds until you hit the mark. Once over 160° add the cooked vegetables along with the leftover rice. Stir to incorporate and cook for another 2 minutes to allow the rice to heat through. Taste and adjust salt, pepper and toasted sesame oil as desired. Sprinkle with chopped scallions and serve. When frying in a shallow skillet we try to use an inexpensive splatter screen to keep the walls from getting an oil bath. Don’t want to get your hands extra dirty by mixing the chicken with the marinade? Toss the chicken in a zip-top bag, wash your hands, add the marinade ingredients, seal the bag and squish the chicken around until everything is well and rightly coated. You can totally use all peanut oil in the recipe, no need to have both vegetable oil and peanut oil out. Both are handy when I cook and I was making it up as I go. I do prefer peanut oil for high heat frying.